Tackling youth unemployment is a huge priority at UKCES and we do it in many different ways. The latest was via our monthly youth employment communications campaign. We asked our Commissioners, staff and Twitter followers to tell us what their advice to their younger selves would be for finding a job, getting into work, progressing, succeeding, eventually retiring… all of these rungs on a career ladder that were relatively straightforward to climb up a generation or two ago, and which are now a daunting prospect for the UK’s 917,000 young unemployed. The idea was to collect #ToMyYoungerSelf advice, thoughts and top tips, and compare it against what the research says employers and young people value the most. As people’s #ToMyYoungerSelf stories came in, we were struck that very few focused on getting heaps of qualifications and skills. Rather, they were all about having the right behaviours and attitudes for work, and on the value of experience. The research backs this up. Our latest Employer Skills Survey asked employers whether they found their young recruits well prepared for work, and an overwhelming majority said yes – good news! We then asked those who said no “why not?”, and the top two answers were ‘lack of experience’ and ‘lack of motivation or poor attitude’. This shows that the focus on attitude and experience in people’s advice to their younger selves is spot on. In fact, it is more important than ever before. This is a ‘jinxed generation’ of young people that in some ways is worse off than their parents’ and grandparents’ generations, and struggling to get into work in the context of a labour market full of structural barriers. We think that work experience and inspiration for young people goes a long way in building the resilience, behaviours and attitudes expected at work as well as giving young people invaluable experience. The onus is on businesses and education to work together to create these opportunities for young people, which can be anything from: the traditional one or two week placements, to employers acting as role models by visiting schools and doing mentoring or mock interviews, through to setting up site visits, challenges or competitions. As a final thought: I was overwhelmed by the positivity, optimism and honesty of people who got involved in the campaign, and going over the different bits and pieces of advice has been truly inspirational. They have all been retweeted and shared widely, which tells me that this advice shouldn’t and doesn’t just apply to our younger selves. It’s 100% relevant to our current selves as well – who can say they’ve nailed the right attitude in the face of every challenge we are presented with at work? Who will say they’ve had enough different experiences, or met enough interesting people, or learnt too many new things in a day? 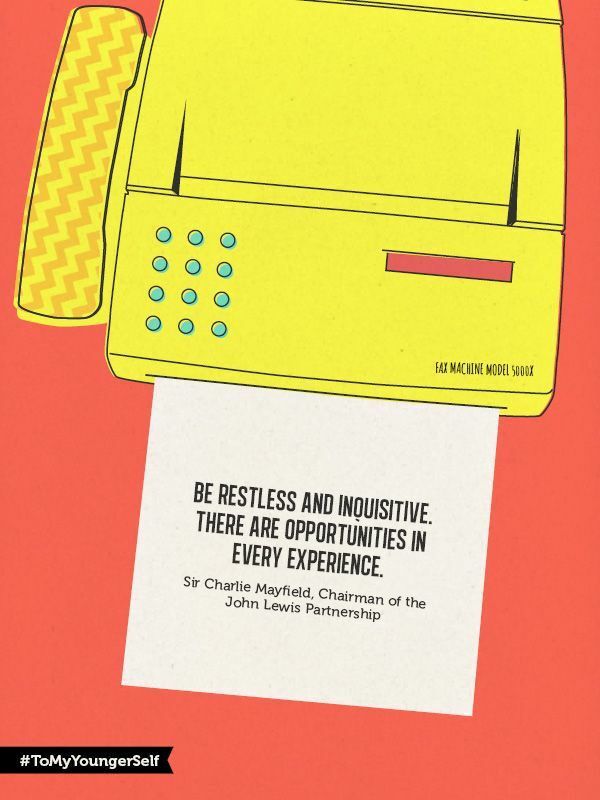 Certainly not me – I think this is why one of my favourite pieces of advice (although it’s very difficult to choose) is from our very own chairman: “Be restless and inquisitive. There are opportunities in every experience”. Don’t take my word for it though – check out our Pinterest gallery and let us know what your favourite advice #ToMyYoungerSelf is! Which inspires you the most?